1 article(s) will be saved. The link information below provides a persistent link to the article you've requested. Persistent link to this record: Following the link below will bring you to the start of the article or citation. Cut and Paste: To place article links in an external web document, simply copy and paste the HTML below, starting with "<A HREF"
To continue, in Internet Explorer, select FILE then SAVE AS from your browser's toolbar above. Be sure to save as a plain text file (.txt) or a 'Web Page, HTML only' file (.html). In Netscape, select FILE then SAVE AS from your browser's toolbar above. If you have any problems or questions, contact Technical Support at http://support.epnet.com/CustSupport/Customer/OpenCase.aspx or call 800-758-5995. Abstract: There are a number of strong geometric and substantive assumptions involved when assessment instruments are used to classify persons into typological categories defined by the coordinates of the Interpersonal Circle. These assumptions were derived from interpersonal theory and stated in the form of hypotheses that were tested with reference to the revised Interpersonal Adjective Scales (IAS-R) in three groups of university undergraduates. Study 1 found strong support for the geometric and psychometric assumptions underlying diagnostic classification. Study 2 supported hypotheses concerning the relation between interpersonal profile variance (vector length) and measures of psychopathology. Study 3 found significant relations between vector length and interpersonal problems within all IAS-R diagnostic groups. We discuss the results in the context of their implications for psychodiagnostic research and for the experimental study of interpersonal processes. This work was supported by Social Sciences and Humanities Research Council of Canada Grant 410-87-1322 awarded to Jerry S. Wiggins. We would like to thank Candace Taylor Wiggins and two anonymous reviewers for their helpful comments on an earlier version of this article. Correspondence may be addressed to: Jerry S. Wiggins, Department of Psychology, University of British Columbia, 2136 West Mall, Vancouver, British Columbia V6T 1Y7 Canada. Circumplex structure of revised Interpersonal Adjective Scales (N = 1,161). Figure 1 (e. g. , Wiggins, Steiger, & Gaelick, 1981). The revised Interpersonal Adjective Scales (IAS-R) were constructed to provide a more convenient short-form version of the IAS, one with improved substantive and structural characteristics (Wiggins, Trapnell, & Phillips, 1988). The IAS-R comprises 64 single adjectives (e. g. , dominant) to which subjects respond by indicating the degree of self-descriptive accuracy on an eight-point Likert scale ranging from extremely inaccurate to extremely accurate. Item responses are cumulated to form eight scales, each alphabetically labeled in a counterclockwise direction around the circle: Assured-Dominant (PA), Arrogant-Calculating (BC), Cold-hearted (DE), Aloof-Introverted (FG), Unassured-Submissive (HI), Unassuming-Ingenuous (JK), Warm-Agreeable (LM), and Gregarious-Extraverted (NO). As Figure 1 illustrates, these octant scales may also be designated in terms of their expected geometric location with reference to the horizontal Lov axis: PA (90°), BC (135°) ... NO (45°). The circular configuration of variables in Figure 1 is subject to a variety of interpretations. One such interpretation would assert that the eight variables exhibit a circular ordering without beginning or end. In correlational terms, this would mean that the ordered patterning of correlations of, for example, (PA vs. BC) > (PA vs. DE) > (PA vs. FG) > (PA vs. HI) exists in all parts of the matrix of intercorrelations among variables. This interpretation is made without reference to the specific magnitudes of the correlations, their angular locations, or their distance from the circle's center. It is the interpretation used by Guttman (1954) when he first proposed the concept of a circumplex. A less formal interpretation of Figure 1 would assert that it provides a convenient pictorial representation of concepts associated with an interpersonal theory of personality. With reference to the concepts of dominance and love, one may portray different interpersonal types and illustrate their "movement" both around the circle (personality change) and from the center toward the periphery of the circle (extremity of personality type). This nonquantitative representation of interpersonal space is reminiscent of Lewin's (1936) use of hodological space to represent the constructs of his system. It should be evaluated for its heuristic potential to generate testable hypotheses, and indeed it has proven valuable in that respect. Figure 1 may also be taken to be a formal geometric model of the interrelations among indicants of constructs derived from an interpersonal theory of personality. Under this interpretation, the specific angular location of person variables (indicants) and their distance from the center of the circle should provide an empirical basis for testing hypotheses derived from interpersonal theory. Interpersonal assessment procedures that use geometric calculations to assign individuals to typological categories or to evaluate the relative adaptiveness of individuals within typological categories (e. g. , Leary, 1957) are based on strong metric assumptions. Such procedures cannot be rationalized on the grounds that interpersonal variables exhibit a circular ordering or by reference to the fact that individual investigators prefer to think of interpersonal behavior in circular terms. These procedures can be justified only by demonstrating that the measuring instruments involved meet the geometric assumptions of the formal model. In this article, we evaluate the extent to which one such instrument, the IAS-R, meets these criteria with respect to the topic of interpersonal diagnosis. where Zi is the standardized octant score in the i th category (the categories LM, NO, PA, etc. being numbered 1, 2, 3, etc. ) and θi is the angle at the center of the category, namely, (i − 1) × 45° (LaForge et al. , 1954, pp. 138-140). The cosine and sine weights result in two orthogonal linear combinations of the octants that have maximum variance (i. e. , the first 2 principal components) under the assumption of circumplexity. The expressions are multiplied by . 3 to give them unit variance. Table 1. 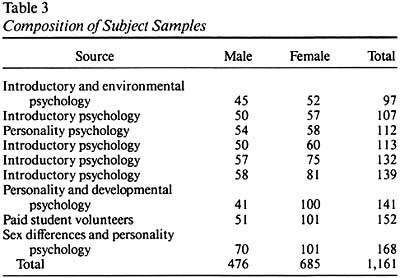 The first column contains the interpersonal profile of an individual expressed as standard scores with reference to normative data that is described in Study 1. From the profile alone one can surmise that the individual is an assured-dominant type. The second column provides the angular direction of each octant and the third and fourth columns the sine and cosine of these angles. The Lov coordinate value is obtained by summing the products of Columns 1 and 3: (1. 45)(. 00) + (. 70)(−. 707) + ... etc. and multiplying the result by . 3. The Dom coordinate value is obtained in similar fashion from Columns 1 and 4. The Lov and Dom coordinates locate a single point in the interpersonal plane. A vector from the origin to the point is characterized by its length and its angular direction as measured by its counterclockwise distance from the positive horizontal axis. That is, the Cartesian coordinates Lov and Dom are expressed in polar coordinates angle and vector length. Angle and vector length serve different purposes in diagnostic classification. The angular location is used to assign category membership. In the present example, the individual's angular location is 87. 9°, which is clearly within the assured-dominant category (i. e. , between 67. 5° and 112. 5°). The vector length corresponding to a given individual's octant scores is basically an index of the standard deviation of those scores. Conceptually, individuals whose geometric location falls far from the center of the Interpersonal Circle have been considered deviant in a psychiatric as well as a statistical sense (e. g. , Leary, 1957). With some possible exceptions (Chartier, 1984; Wiggins & Holzmuller, 1978, 1981), deviance has not been clearly equated with profile variance, although as is now shown, such an equating is completely consistent with the psychometric implications of interpersonal theory. For most interpersonal theorists (e. g. , Carson, 1969; Kiesler, 1983; Leary, 1957; Millon, 1981), it is axiomatic that interpersonal behaviors fall on continua of intensity ranging from the moderate and generally adaptive to the extreme and often maladaptive. It has also been assumed that intensity of expression is related to interpersonal flexibility, in the sense that dysfunctional individuals also rely rigidly on a relatively narrow band of extreme actions and reactions to the exclusion of other, possibly adaptive, modes of response. When conjoined, the concepts of intensity and flexibility imply a patterning of behavior that, in the present instance translates into a profile of interpersonal dispositions. Adaptive interpersonal functioning may therefore be construed as the moderate, flexible, and adaptive expression of a characteristic pattern of interpersonal behaviors. The particular pattern expressed will vary with the type of individual, as indicated by his or her average directional tendencies with respect to the Dom and Lov coordinates. Thus, an assured-dominant type of person (90°) is one who will often behave in a confident or assertive way, will somewhat less frequently behave in an arrogant or calculating way, will seldom behave in an unassured or submissive way, and so forth. This is to emphasize that there is a characteristic pattern associated with being an assured-dominant type and that this pattern is shared by prototypical members of that type. Maladaptive interpersonal functioning with the same directional tendencies may be characterized as the exaggerated, inflexible, and dysfunctional expression of the same pattern of interpersonal behaviors. The prototypical patterns of both assured-dominant (adaptive) and overassured-autocratic (maladaptive) types are the same. They differ only in profile variance. This comparability of profile configuration for adaptive and maladaptive subjects within the same diagnostic category should reflect a more general consistency of profile configuration for all subjects, regardless of diagnostic group. That is, the semantic constraints of the interpersonal circumplex (adjacent variables moderately correlated, opposite variables negatively correlated, etc. ) should operate uniformly for all diagnostic groups. Thus, the profile configuration of assured-dominant types and that of cold-hearted types should theoretically be identical. Profiles of the two groups would be expected to differ only in angular orientation. Because vector length is, psychometrically, an index of the standard deviation of a profile, and because profile configurations are expected to differ only in angular orientation, there is no a priori reason to assume that vector length would, in and of itself, be systematically related to elevations on any of the eight variables of the interpersonal circumplex. Thus, for example, in a random sample of subjects, a high variance profile could be equally indicative of the elevated FG scale of an aloof-introverted type and the elevated NO scale of a gregarious-extraverted type. By the reasoning just stated for interpersonal types, it is unlikely that there will be systematic relations between vector length and scores on outside measures of deviance or general psychopathology. Although nonsubstantive considerations, such as those that led Berg (1955) to formulate the deviation hypothesis, might lead to the expectation that all indexes of deviation will be positively correlated, there is very little evidence to support such an expectation (Wiggins, 1973). On the other hand, the interpersonal theory presented earlier would predict relations between vector length and general psychopathology within certain diagnostic categories of the interpersonal circumplex. For example, one might anticipate a relation between vector length and general psychological discomfort (neuroticism) within a group of subjects who have all been classified as aloof-introverted types. Within the context of the interpersonal circumplex theory outlined earlier, the mean vector direction of a profile of interpersonal variables is assumed to provide an index of a subject's characteristic pattern of interpersonal behaviors (e. g. , assured-dominant), and the vector length of a subject's profile is assumed to provide an index of the intensity, flexibility, and adaptiveness of that characteristic pattern (e. g. , overassured-autocratic). 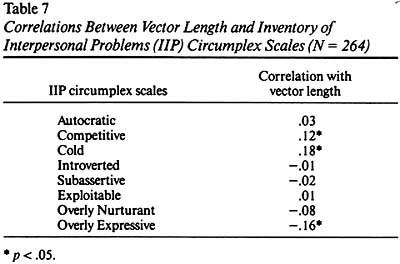 For the reasons stated in the preceding two paragraphs, one would not expect vector length to be related to measures of interpersonal problems in a random sample of unclassified subjects. However, to the extent that measures of interpersonal problems that span the full universe of problems defined by the coordinates of Dom and Lov are available, then correlations with vector length would be predicted within all eight diagnostic categories of the interpersonal circumplex. Table 2, and as can be seen from that table, they are stated in the form of nine hypotheses that are tested in the three empirical studies to be reported. The assumptions in Table 2 appear in the same order as the arguments we developed in our introduction. They progress from fundamental issues of measurement to more substantive issues of interpretation. Although the failure to meet an early assumption would not preclude the possibility of empirical support for a later assumption, it would to some extent vitiate the theoretical interpretation that might otherwise be placed on the empirical finding. For example, if the IAS-R did not have the rigorous geometric properties required by the measurement model (Assumption 1), there could still be a significant empirical relation between vector length and interpersonal problems within IAS-R diagnostic groups (Assumption 9). However, the empirical relation found in connection with Assumption 9 could not be interpreted within the context of the geometric model postulated by the theory. In Study 1, we tested five basic hypotheses that relate to the geometric properties of the IAS-R in relation to circumplexity, vector length, and characteristic profile configurations. 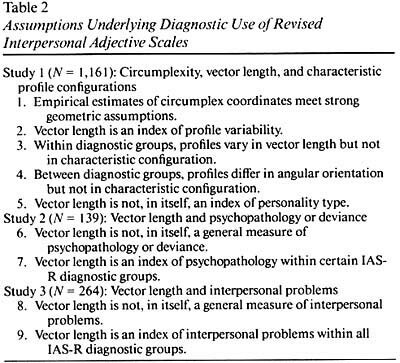 In Study 2, we examined IAS-R vector length within diagnostic groups in relation to measures of general psychopathology provided by Lanyon's (1973) Psychological Screening Inventory. In Study 3, we looked at IAS-R vector length within diagnostic groups in relation to the Inventory of Interpersonal Problems (Horowitz, Rosenberg, Baer, Ureno, & Villasenor, 1988). Taken together, the results of these three studies provide the basis for a preliminary evaluation of IAS-R as an indicant of the constructs associated with an interpersonal theory of diagnosis. Table 3, we recruited subjects from a variety of undergraduate psychology courses. Although the instruments administered in addition to the IAS varied from study to study, the IAS was always the first test given. The tests were administered in class, in our laboratory, or on a take-home basis. The only instrument considered in this study was the IAS-R. This is a short form version of the IAS that has improved substantive and structural characteristics and acceptable scale reliabilities (Wiggins et al. , 1988). We scored the IAS-R protocols of each subject for the eight octants (e. g. , assured-dominant [PA]) of the interpersonal circumplex. We extracted two principal components from the intercorrelations among these octants in order to evaluate the circumplexity of the IAS-R and to compare theoretical geometric weights for assignment to diagnostic groups with empirical factor score coefficients used for the same purpose. We assigned each subject to one of eight diagnostic (type) categories on the basis of the procedure for determining mean vector direction presented in Table 1. The subjects were fairly evenly distributed across the eight diagnostic categories, with a mean of 145 subjects per category and a range from 134 to 158. Vector length (distance from the center of the circle) was also determined for each subject from the last formula presented in Table 1. Assumption 1: Empirical estimates of circumplex coordinates meet strong geometric assumptions. The IAS-R scales conform well to the theoretically expected circumplex structure. Figure 1 presents a plot of the eight IAS-R scales on the first 2 principal components extracted from the intercorrelation matrix of scales in our sample of 1,161 subjects. These two components together account for 71. 11% of the total variance among IAS-R scales. Equally noteworthy, the components account for approximately the same amount of variance (36. 29% and 34. 82%, respectively); a difference of only 1. 47 percentage points. The latter is important for the circularity of the solution, as discrepancies in magnitude between the two latent roots will yield an elliptical structure. The eigenvalue corresponding to the 3rd principal component was . 78, and this component accounted for less than 10% of the total variance. The formulas for calculating Lov and Dom are theoretical in the sense that the weights by which each of the standardized octant scores is multiplied are based on the sines and cosines of ideal angular locations. The empirical counterparts of these theoretical vector weights would be the empirical factor score coefficients associated with the two principal components extracted from the intercorrelations among octants. The extent to which the two sets of formulas are in agreement provides an index of the goodness of fit of empirical IAS-R subject assignment to that specified by the geometric model. For each subject we computed Dom and Lov coordinate estimates by the geometric formulas given in Table 1 and by factor score estimates derived from the principal-components analysis of the IAS-R scales. In the total subject sample, the correlation between theoretical and empirical estimates was . 999 for the Dom coordinate and . 999 for the Lov coordinate. When subjects were assigned to one of eight diagnostic groups on the basis of the two sets of formulas, there was agreement in assignment for 97. 2% of the subjects. Assumption 2: Vector length is an index of profile variability. We computed the standard deviation of each eight-octant profile of interpersonal variables for each subject. The empirical correlation between profile standard deviation and vector length in this sample was . 946. Assumption 3: Within diagnostic groups, profiles vary in vector length but not in characteristic configuration. We ranked subjects within each of the eight diagnostic categories in terms of their vector lengths and arbitrarily defined the upper 10% as extreme and the remainder as moderate. On average, there were 14 extreme and 131 moderate subjects in each of the eight diagnostic categories. Within each category we correlated the mean profiles of extreme and moderate groups. These correlations approached unity in all categories; the average correlation was . 989 and the range was from . 981 to . 997. This finding is compatible with our assumption that moderate variance and extreme variance subjects within the same diagnostic category have the same characteristic profile pattern. It thus provides justification for our interpretation of vector length as a homogeneous index of extremity or deviance. Assumption 4: Between diagnostic groups, profiles differ in angular orientation but not in characteristic configuration. 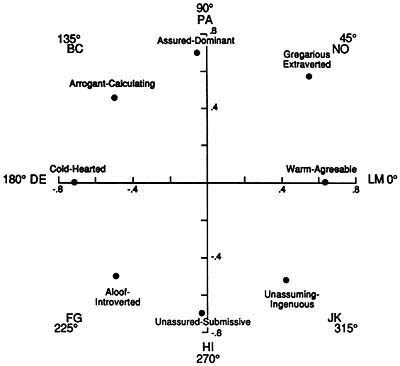 Mean profile of interpersonal variables for subjects classified as cold-hearted (DE; n = 135). (FG = Aloof-Introverted, HI = Unassured-Submissive, JK = Unassuming-Ingenuous, LM = Warm-Agreeable, NO = Gregarious-Extraverted, PA = Assured-Dominant, and BC = Arrogant-Calculating). Figure 2 presents the mean profile of interpersonal variables for the 135 subjects classified as falling within the DE diagnostic category. This profile exhibits a characteristic shape that we refer to informally as the "interpersonal spaceship": the highest elevation occurs on the defining octant (DE), followed by adjacent octants (BC and FG), and diminishing to the highly truncated opposite octant (LM). Given the semantic constraints of the interpersonal circumplex, this configuration should occur in other diagnostic groups that differ in angular orientation. To test the uniformity of semantic constraints around the circumplex, we compared the mean profiles of the eight diagnostic groups in the total sample. Lag correlations were computed between all combinations of diagnostic group profiles. In comparing profiles of the PA and BC diagnostic groups, for example, the mean scores for the former group, PA, BC, DE, ... etc. , were correlated with the mean scores for the latter group, BC, DE, FG, ... etc. The mean of the 28 lag correlations thus computed was . 978; the standard deviation was . 01. Assumption 5: Vector length is not, in itself, an index of personality type. Table 4, the correlations ranged from −. 02 (HI) to . 13 (DE), with a mean of . 04. Although there was a slight tendency for vector length to be correlated with scores on undesirable IAS-R octants, it was neither strong nor consistent. The highest significant correlation obtained suggests a shared variance of 2%. The strong geometric assumptions underlying the interpretation of the structural relations among IAS-R scales as a circumplex and the assignment of subjects to diagnostic groups based on that circumplex are more than adequately met. The finding that the theoretical sine and cosine weights for determining the angular locations of interpersonal profiles are equivalent to the empirical IAS-R factor coefficients is especially noteworthy. This result suggests that in large samples of subjects, IAS-R factor estimates of Dom and Lov will converge on the theoretical geometric formulas. Because no instrument can be considered error-free, we recommend the theoretical formulas presented in Table 1 over empirical IAS-R factor estimates in assigning subjects to diagnostic groups, especially in samples of moderate size. Profile configurations of IAS-R variables were remarkably comparable both for moderate and extreme subjects within the same diagnostic groups and for subjects in different diagnostic groups. It is still possible, of course, that subjects with the same profile angular location and vector length score could have different profile configurations, or that subjects assigned to different diagnostic groups could have profile configurations that differed in ways other than angular location. However, these possibilities are empirically so unlikely that any profile that deviates markedly from semantic expectations should be viewed with suspicion. Vector length is an index of profile variability (standard deviation), and this, together with the above-mentioned findings on the constancy of profile shapes within diagnostic categories, supports the idea of deviance as an exaggeration of a characteristic profile configuration, or type. Although three of the correlations of vector length with IAS-R octant scores were statistically reliable in the present large sample, the overall pattern of correlations was not supportive of a moderate or consistent relation. The critical next stage of investigation explores the relation between vector length and general measures of psychopathology within IAS-R diagnostic categories. The subjects were 139 University of British Columbia undergraduates (58 men and 81 women) who were enrolled in the first term of introductory psychology. The instruments were administered in class as part of an introduction to personality tests. In addition to the IAS-R, the subjects were given Lanyon's (1973) Psychological Screening Inventory (PSI). This 130-item, truefalse personality inventory was designed for use as a brief mental health screening device. In addition to its brevity, one of this instrument's principal advantages is the fact that the scales are substantially correlated with MMPI clinical and validity scales, even though the scales include a minimum of objectionable items. Four nonoverlapping pathology scales and a validity scale may be scored from the PSI. The Alienation scale was designed to indicate the similarity of a respondent to hospitalized psychiatric patients. The MMPI correlates include Psychasthenia (Pt), Paranoia (Pa), and Schizophrenia (Sc). The Social Nonconformity scale was designed to indicate the similarity of a respondent to incarcerated prisoners. The highest MMPI correlate is Psychopathic Deviate (Pd). The Discomfort scale was designed to assess the dimension of perceived maladjustment, anxiety, or neuroticism. The highest correlate is Welsh's A -scale, a marker of the first factor of the MMPI. The Expression scale was designed to measure the dimension of undercontrol, impulsivity, or extraversion. The highest MMPI correlate is Hypomania (Ma). The Defensiveness scale was designed to assess defensiveness in test-taking attitude. The highest MMPI correlates are Lie (L) and Test-taking Attitude (K). We scored the IAS-R protocols of each subject for the eight octants of the interpersonal circumplex. We assigned subjects to one of eight diagnostic categories on the basis of the procedure for determining mean vector direction discussed in Study 1. The mean number of subjects per diagnostic category was 17 and the range was from 12 to 30. We also determined vector length for each subject by the method discussed in Study 1 and scored the four pathology scales and the validity scale of the Psychological Screening Inventory for each subject. Assumption 6: Vector length is not, in itself, a general measure of psychopathology or deviance. Table 5, these correlations ranged from −. 09 to . 13, with a mean of −. 01. Perhaps the most important of these nonsignificant correlations is that between vector length and discomfort (−. 01), as the latter has been demonstrated to be substantially correlated with the first factor of the MMPI, a general measure of psychopathology or deviance. Assumption 7: Vector length is an index of psychopathology within certain IAS-R diagnostic groups. Within the arrogant-calculating category, the correlation between vector length and the Social Nonconformity scale is understandable because of the relation between BC and Machiavellianism (Wiggins & Broughton, 1985) and the relation between BC and the deployment of manipulation tactics (Buss, Gomes, Higgins, & Lauterbach, 1987). Within the aloof-introverted category, the correlation between vector length and discomfort suggests a not-unexpected relation between FG and the dimension of anxiety or perceived maladjustment. 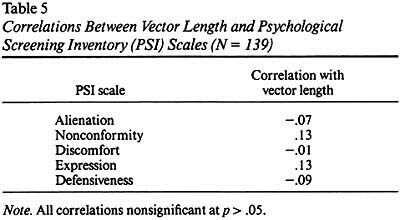 The negative correlation between vector length and discomfort within the assured-dominant category is compatible with the self-assured ego-resiliency (Block, 1965) of the PA variable. Finally, the pattern of correlations between vector length and the PSI Expression scale, within the arrogant-calculating, unassured-submissive, and gregarious-extraverted categories, suggests that the Expression scale includes a fairly broad band of content reflecting undercontrol, impulsivity, and extraversion. These interpretations must be tempered by the realization that they were obtained in small samples of nonclinical subjects. These data, although limited, nonetheless serve to underscore a point regarding the relation between interpersonal dispositions and psychopathology that has hitherto been neglected in the empirical literature. The general psychopathology component of the MMPI (PSI Discomfort scale) is not general in the sense that it is associated with deviance in all or even most interpersonal dispositions: The correlation between general deviance (vector length) and discomfort was essentially zero in the present study. However, when vector length was considered within those dispositional types captured by the relatively restricted MMPI item pool (Wiggins, 1987), we obtained significant correlations. These correlations, although forming a substantively coherent pattern, did not reflect a circumplex ordering (moderate correlations appearing within adjacent diagnostic groups, negative correlations appearing within opposite diagnostic groups). The first principal component of the MMPI reflects a simplex of psychopathology, ranging from relatively low (Ma) to relatively high (Sc) impairment (Wiggins et al. , 1981). The dispositions measured by the IAS-R reflect a circumplex of personality characteristics that are presumably associated with a broader range of interpersonal problems. We investigate this last proposition in Study 3. 1. The subjects were 264 University of British Columbia undergraduates (122 men and 142 women) who were enrolled in the first term of lower division psychology courses. Testing materials were distributed in classes for completion on a take-home basis. In addition to the IAS-R, the subjects were given the Inventory of Interpersonal Problems (IIP) developed by Horowitz (1979) and his associates (Horowitz et al. , 1988). The initial item pool of the IIP consisted of verbatim statements of problems made in the course of a videotaped intake interview by patients about to undergo psychotherapy. Interpersonal problem statements were identified by judges and classified under the two general categories of "I can't" (e. g. , "trust other people") and "I have to" (e. g. , "avoid other people"). When meaning-similarity sortings of these statements were subjected to a multidimensional scaling analysis, the dimensions of control (dominant-submissive) and affiliation (friendly-hostile) were clearly identified. The most recent version of the IIP is composed of 127 items, 78 of which have the stem "It is hard for me to" (e. g. , "be assertive with another person") and 49 of which are presented as "things that you do too much" (e. g. , "I fight with other people too much"). The items are answered on a five-point Likert scale that ranges from not at all to extremely. Responses to these items are cumulated on a set of 12 nonoverlapping interpersonal problems scales. In addition, a set of 8 nonoverlapping interpersonal problems circumplex scales have recently become available (Alden, Wiggins, & Phillips, 1987). These scales exhibit a clear circumplex structure in both normal and psychiatric populations and have acceptable test-retest reliabilities. Although the scales have been interpreted as reflecting dysfunctional aspects of interpersonal dispositions measured by the IAS-R circumplex, they were developed independently of that instrument. In counterclockwise order around the circumplex, these scales are Autocratic, Competitive, Cold, Introverted, Subassertive, Exploitable, Overly Nurturant, and Overly Expressive. We scored the IAS-R protocols of each subject for the eight octants of the interpersonal circumplex. Subjects were assigned to one of eight diagnostic categories on the basis of the procedure for determining mean vector direction presented in Study 1. The mean number of subjects per diagnostic category was 33 and the range was from 19 to 45. We also determined vector length for each subject by the method described in Study 1. The eight interpersonal problems circumplex scales of the IIP were also scored for each subject. Assumption 8: Vector length is not, in itself, a general measure of interpersonal problems. Table 7, these correlations ranged from −. 16 to . 18, with a mean of . 07. Of the three reliable correlations (p < . 05), two were positive and one was negative. As was true of the correlations between vector length and IAS-R octant scores (Table 4), there is a slight tendency for vector length to be correlated with scores on undesirable IIP circumplex scales, but again, this tendency is neither strong nor consistent. The highest significant correlation obtained suggests a shared variance of 3%. 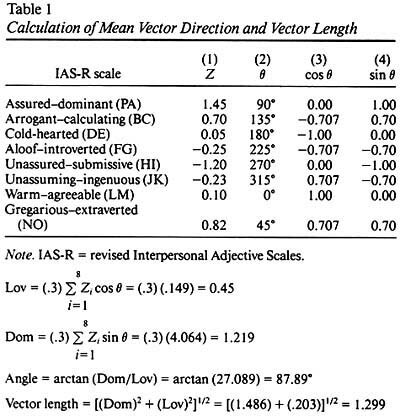 Assumption 9: Vector length is an index of interpersonal problems within all IAS-R diagnostic groups. We consider the two hypotheses of this study to be confirmed because whereas vector length is only slightly and inconsistently correlated with IIP circumplex scales in the total sample of subjects, it is significantly although not substantially correlated with IIP circumplex scales within all of the IAS-R diagnostic categories. Interpretation of this pattern of obtained correlations is complex because, unlike the expected relations between vector length and the general measures of psychopathology provided by the PSI scales in Study 2, the expected relations between vector length and IIP circumplex scales in our study involve circumplex considerations in which vector length is anticipated to be positively related to IIP circumplex scales within comparable dispositional categories, negatively related to opposite scales, and unrelated to orthogonal scales. The expected circumplex pattern of correlations may be illustrated with reference to the first column of Table 8. 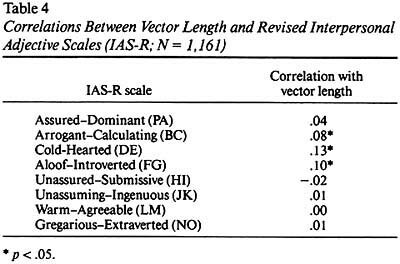 Within the assured-dominant diagnostic category (PA) of IAS-R, vector length would be expected to be positively related to its comparable Autocratic scale (. 36), negatively related to its opposite Subassertive scale (−. 27), positively related to the adjacent scales of Competitive (. 27) and Expressive (a miss), negatively related to its opposite off-quadrant scales of Introverted (−. 27) and Exploitable (−. 35), and unrelated to the orthogonal scales of Cold (ns) and Nurturant (ns). Taking into account the signs of significant correlations and the occurrence of anticipated nonsignificant correlations, 38 of the 64 possible correlations, or lack of same, in Table 8 are in accord with circumplex expectations. Of the expected significant correlations that did or did not occur, only three were not in accord with predictions. Although there are many instances in which the relative magnitude of the significant correlations departed from expectations, the overall pattern of correlations in Table 8 strongly suggests the operation of two circular systems. Consideration of the substantive convergences, or lack of same, between the IIP and the IAS is well beyond the scope of this article. This rather complex topic is treated elsewhere (Alden et al. , 1987). The Interpersonal Circle is a conceptual representation of the domain of interpersonal behavior that depicts interpersonal variables as vectors in a two-dimensional circular space formed by the coordinates of dominance and love. Within that circular space, the vectors that emanate from the center of the circle are interpreted as continua of intensity ranging from the moderate and generally adaptive to the extreme and often maladaptive. Interpersonal diagnosis involves the assignment of subjects to typological categories defined by the average directional tendencies of their interpersonal behaviors with reference to the coordinates of dominance and love. 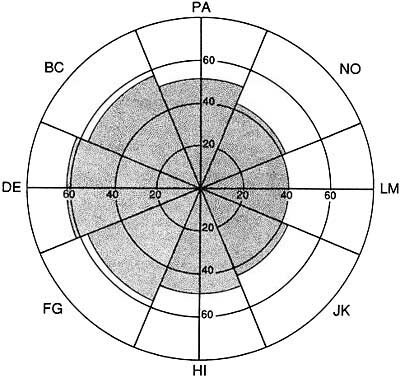 Subjects classified as falling within the same typological sector of the Interpersonal Circle exhibit the same characteristic pattern of interpersonal behaviors, but differ from one another in terms of the intensity or adaptiveness of that pattern, as indicated by their distance from the center of the circle. The properties of the Interpersonal Circle just described may be viewed as simply a convenient pictorial representation of concepts associated with an interpersonal theory of personality. However, to the extent that these properties are transformed into concrete assessment procedures that assign subjects to diagnostic groups on the basis of geometric calculations, the strong metric assumptions underlying such assignments must be justified. We identified nine such assumptions that ranged in scope from fundamental issues of measurement to more substantive issues of interpretation. These assumptions were stated in the form of hypotheses concerning properties of the IAS-R that were tested in three empirical studies. The eight octant scales of the IAS-R exhibited a clear circumplex structure in accord with theoretical expectations. Factor score coefficients for the two principal components underlying this circumplex structure were virtually identical to the theoretical sine and cosine weights for ideal angular locations. This latter finding provides strong support for IAS-R diagnostic assignments based on geometric principles. The theory-based hypothesis that subjects with extreme and moderate vector lengths within the same IAS-R diagnostic groups would exhibit the same characteristic profile pattern was also strongly supported. More generally, we found the characteristic shape of interpersonal profiles (the interpersonal spaceship) in all diagnostic groups, regardless of angular orientation. Overall, it may be concluded that the geometric properties of the IAS-R meet the basic assumptions of measurement associated with the assignment of subjects to diagnostic groups. Properties of the heretofore neglected variable of vector length were generally in accord with theoretical expectations. On both conceptual and psychometric grounds, vector length should be an index of characteristic profile variability (standard deviation), and indeed we found this to be the case. The hypothesis that vector length is, in itself, unrelated to IAS-R octant variables was clearly supported in a large and presumably representative sample of university students. The expected relations between vector length and measures of psychopathology within IAS-R diagnostic groups depends very much on the psychopathology measures used. As Horowitz (1979) has emphasized, the relation between symptoms (e. g. , depression) and interpersonal problems (e. g. , intimacy) has not been clearly explicated, and one would certainly not expect a one-to-one correspondence. Psychiatric screening devices, such as Lanyon's PSI, assess both symptoms and a limited variety of interpersonal problems. Within our sample of university students, PSI scales were unrelated to vector length, as expected. Moreover, within some IAS-R diagnostic groups we found relations between vector length and PSI scales that formed a substantively coherent pattern. Although these findings were in accord with expectations, they serve primarily to justify further explorations of relations between IAS-R diagnosis and traditional general measures of psychopathology such as the MMPI. The interpersonal problems circumplex scales from the Horowitz et al. (1988) IIP were generally unrelated to vector length, as expected. Also as expected, vector length was significantly although not substantially correlated with interpersonal problems scales within all IAS-R diagnostic groups. We interpret these findings as supporting our hypotheses concerning the relation between IAS-R profile vector length and interpersonal problems and as justifying further research on the theoretically important topic of the relation between interpersonal dispositions and interpersonal problems. The sound geometric and psychometric properties of the IAS-R suggest that it may be applied fruitfully to traditional clinical research topics such as the psychodiagnosis of personality disorders. More generally, these properties of the IAS-R should increase measurement precision in experimental studies involving the preselection of subjects on individual difference measures of interpersonal behavior. In such experimental studies, subjects are typically assigned to high or low groups on the basis of scores on a single personality inventory scale without reference to their possible scores on other (unmeasured) interpersonal variables. Our findings with the IAS-R in these studies suggest that assignment of subjects to diagnostic categories results in homogeneous groupings of subjects with respect to characteristic patterns of interpersonal behavior, and that vector length may be used as an index of the extremity of these characteristic patterns. Assignment of subjects to groups on the basis of multiscale configural patterns results in increased substantive homogeneity within groups, even with scales of less than desirable psychometric properties, such as MMPI scales (Payne & Wiggins, 1972). The precise and theoretically based assignment of subjects to preselection groups on the basis of IAS-R may serve to advance currently active areas of experimental inquiry such as interpersonal perception and interpersonal construal style, complementarity and similarity in dyadic transactions, and competition and cooperation in experimental games. We are grateful to Lynn Alden for providing these data, which were collected for another purpose. 1. Alden, L., Wiggins, J. S. & Phillips, N. (1987). Interpersonal dispositions and interpersonal problems. Unpublished manuscript, Department of Psychology, University of British Columbia, Vancouver, BC, Canada. 2. Benjamin, L. S. (1974). Structural analysis of social behavior. Psychological Review, 81, 392-425. 3. Berg, I. A. (1955). Response bias and personality: The deviation hypothesis. Journal of Psychology, 40, 61-71. 4. Block, J. (1965). The challenge of response sets: Unconfounding meaning, acquiescence and social desirability in the MMPI. New York: Appleton-Century-Crofts. 5. Buss, D. M., Gomes, M., Higgins, D. S. & Lauterbach, K. (1987). Tactics of manipulation. Journal of Personality and Social Psychology, 52, 1219-1229. 6. Carson, R. C. (1969). Interaction concepts of personality. Chicago: Aldine. 7. Chartier, B. M. (1984). The meaning and measurement of interpersonal flexibility. Unpublished doctoral dissertation, University of Saskatchewan, Saskatoon, Sask. , Canada. 8. Guttman, L. (1954). A new approach to factor analysis: The radex.In P. R. Lazarsfeld (Ed. ),Mathematical thinking in the social sciences(pp. 258-348). Glencoe, IL: Free Press. 9. Horowitz, L. M. (1979). On the cognitive structure of interpersonal problems treated in psychotherapy. Journal of Consulting and Clinical Psychology, 47, 5-15. 10. Horowitz, L. M., Rosenberg, S. E., Baer, B. A., Ureno, G. & Villasenor, V. S. (1988). The Inventory of Interpersonal Problems: Psychometric properties and clinical applications. Journal of Consulting and Clinical Psychology, 56, 885-895. 11. Kiesler, D. J. (1983). The 1982 Interpersonal Circle: A taxonomy for complementarity in human transactions. Psychological Review, 90, 185-214. 12. LaForge, R., Leary, T. F., Naboisek, H., Coffey, H. S. & Freedman, M. B. (1954). The interpersonal dimension of personality: II. An objective study of repression. Journal of Personality, 23, 129-153. 13. Lanyon, R. I. (1973). Psychological Screening Inventory manual. Goshen, NY: Research Psychologists Press. 14. Leary, T. (1957). Interpersonal diagnosis of personality. New York: Ronald Press. 15. Lewin, K. (1936). Principles of topological psychology. New York: McGraw-Hill. 16. Lorr, M. & McNair, D. M. (1965). Expansion of the interpersonal behavior circle. Journal of Personality and Social Psychology, 2, 823-830. 17. Millon, T. (1981). Disorders of personality: DSM III, Axis II. New York: Wiley. 18. Payne, F. D. & Wiggins, J. S. (1972). MMPI profile types and the self-report of psychiatric patients. Journal of Abnormal Psychology, 79, 1-8. 19. Wiggins, J. S. (1973). Personality and prediction: Principles of personality assessment. Reading, MA: Addison-Wesley. 20. Wiggins, J. S. (1979). A psychological taxonomy of trait-descriptive terms: The interpersonal domain. Journal of Personality and Social Psychology, 37, 395-412. 21. Wiggins, J. S. (1980). Circumplex models of interpersonal behavior.In L. Wheeler (Ed. ),Review of personality and social psychology(Vol. 1, pp. 265-294). Beverly Hills, CA: Sage. 22. Wiggins, J. S. (1982). Circumplex models of interpersonal behavior in clinical psychology.In P. C. Kendall & J. N. Butcher (Eds. ),Handbook of research methods in clinical psychology(pp. 183-221). New York: Wiley. 23. Wiggins, J. S. (1987,September). How interpersonal are the MMPI personality disorder scales?In R. L. Greene (Chair),Current research on MMPI personality disorder scales. Symposium conducted at the annual meeting of the American Psychological Association, New York. 24. Wiggins, J. S. & Broughton, R. (1985). The Interpersonal Circle: A structural model for the integration of personality research.In R. Hogan & W. H. Jones (Eds. ),Perspectives in personality: Vol. 1(pp. 1-47). Greenwich, CN: JAI Press. 25. Wiggins, J. S. & Holzmuller, A. (1978). Psychological androgyny and interpersonal behavior. Journal of Consulting and Clinical Psychology, 46, 40-52. 26. Wiggins, J. S. & Holzmuller, A. (1981). Further evidence on androgyny and interpersonal flexibility. Journal of Research in Personality, 15, 67-80. 27. Wiggins, J. S., Steiger, J. H. & Gaelick, L. (1981). Evaluating circumplexity in personality data. Multivariate Behavioral Research, 16, 263-289. Received: April 24, 1987. Revised: December 11, 1987. Accepted: July 11, 1988. Copyright 1989 by the American Psychological Association, Inc.